Party like it’s nineteen #69!!!! Okay okay! In a few days, it’ll be December. The last month of the year; probably the best month in Calabar. O know everyone is anticipating this month. But have you thought of how to usher in the new month? 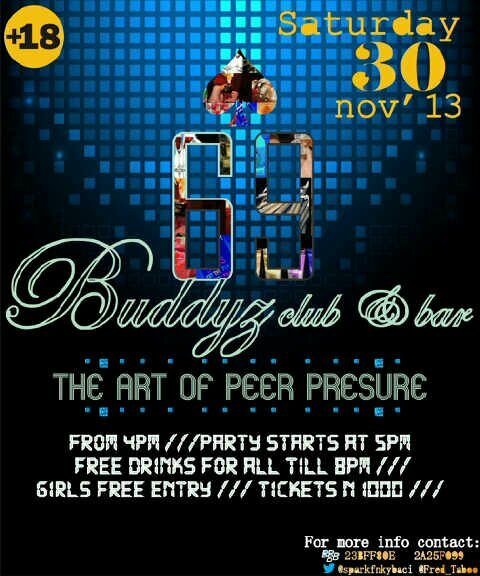 While the big people will be at the tree-lighting ceremony, you should come and party at Buddyz club and bar..
Ticketing: Entry and tickets cost N1000 + FREE ENTRY FOR GIRLS!!!! Age Restriction: A specific range of persons who are 18 and above, special considerations might be given to younger persons. Tickets: Tickets can be gotten at FIESTA FRIES and APPLES or at the wine shop, atekong or by speaking to any of our contacts. Why should you be in attendance? That’s because It’s been a long year and it’s officially the eve Of december so why not come and party like it’s #69!? For those of you who are single and ready to mingle, chances are that you may bump into that special someone at this party. No lie! Show off; that crazy dress or expensive shoe you bought and you’ve been looking for a chance to wear it, don’t wait for Carnival day. THERE WILL BE FREE DRINKS TILL 8PM!!!! This entry was posted in Ads and tagged 69, a good read, blog adverts, Entertainment, party, watch this space!!!!. Bookmark the permalink.